When traveling in Sayulita, Mexico, you may need to get in touch with the property manager of your vacation rental, call to order takeout, or to make a reservation, and it can be very frustrating to figure out how to call a number in Mexico from your US or Canadian cell phone. Alternatively, you may need to call the US or Canada to change an airplane ticket, call relatives, or report a lost credit card while in Mexico. Dialing within Mexico and International calls made from Mexico can be a little confusing and at times, even frustrating to some, including those who consider themselves well-versed world travelers. We've experienced first hand and have heard from several travelers over the years how they get puzzled and frustrated when trying to manage phone calls between cell phones and land lines in Mexico. Add to that equation a different area code or nation code and you may find yourself frantically dialing one combination after another, only to be denied. Trust us, it’s not just you. The variations can be confusing, even for locals. 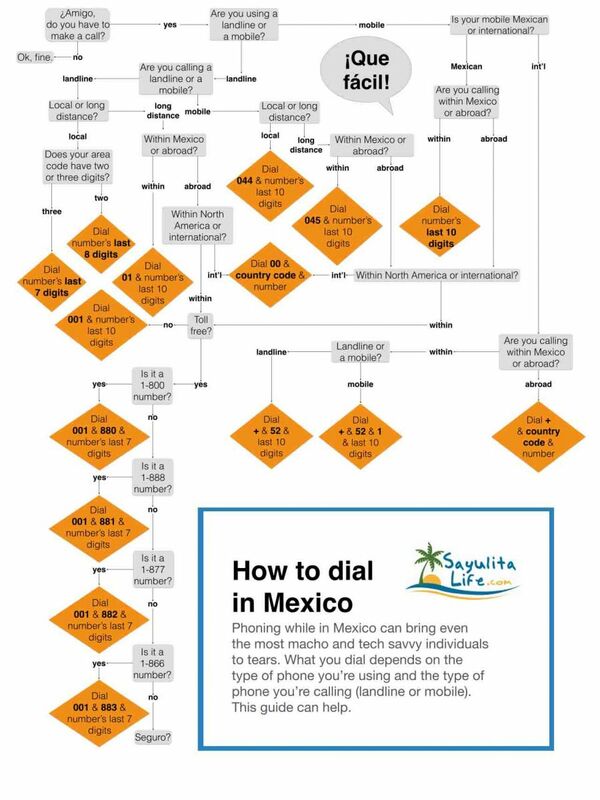 Below is a very informative and helpful info-graphic about dialing in and out to Mexico. Please note that in the Sayulita area, 322 area codes are cell phones and 329 numbers are landlines, both which need to be dialed differently.